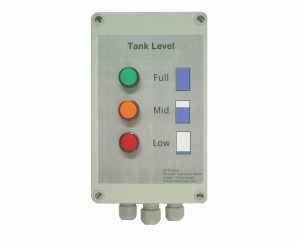 The 3P RCALM Series Display Panels provide a highly effective low water level warning for water tanks. Alternatively float switch wiring can be reversed on the RCALM 1 and 2 Series panels to provide a high level warning instead. Choose from a visible (light), or audible (repeating buzzer) alert or both. Options available for outputs into Building Management Systems (BMS). 24vdc or 230vac options also available. Designed, programmed, built and assembled in the UK. With full UK based technical support , rapid spares availability, and spare parts supply from UK stocks, with full repair/recon service to component level.